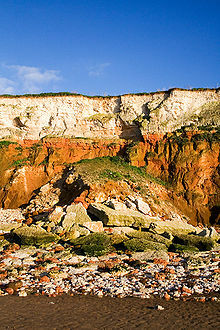 On non-rocky coasts, coastal erosion results in rock formations in areas where the coastline contains rock layers or fracture zones with varying resistance to erosion. Softer areas become eroded much faster than harder ones, which typically result in landforms such as tunnels, bridges, columns, and pillars. Over time the coast generally evens out. The softer areas fill up with sediment eroded from hard areas, and rock formations are eroded away. Also abrasion commonly happens in areas where there are strong winds, loose sand, and soft rocks. The blowing of millions of sharp sand grains creates a sandblasting effect. This effect helps to erode, smooth and polish rocks. The definition of abrasion is grinding and wearing away of rock surfaces through the mechanical action of other rock or sand particles. A place where erosion of a cliffed coast has occurred is at Wamberal in the Central Coast region of New South Wales where houses built on top of the cliffs began to collapse into the sea. This is due to waves causing erosion of the primarily sedimentary material on which the buildings foundations sit. Dunwich, the capital of the English medieval wool trade, disappeared over the period of a few centuries due to redistribution of sediment by waves. Human interference can also increase coastal erosion: Hallsands in Devon, England, was a coastal village washed away over the course of a year, 1917, directly due to earlier dredging of shingle in the bay in front of it. The California coast, which has soft cliffs of sedimentary rock and is heavily populated, regularly has incidents of housing damage as cliffs erodes. Devil's Slide, Santa Barbara, the coast just north of Ensenada, and Malibu are regularly affected. The Holderness coastline on the east coast of England, just north of the Humber Estuary, is one of the fastest eroding coastlines in Europe due to its soft clay cliffs and powerful waves. Groynes and other artificial measures to keep it under control has only accelerated the process further down the coast, because longshore drift starves the beaches of sand, leaving them more exposed. The White Cliffs of Dover have also been affected. Fort Ricasoli, a historic 17th century fortress in Malta is being threatened by coastal erosion, as it was built on a fault in the headland which is prone to erosion. A small part of one of the bastion walls has already collapsed since the land under it has eroded, and there are cracks in other walls as well. In El Campello, Spain, the erosion and failure of a Roman farm fish excavated on rock during the first century B.C. was exacerbated by the construction of a close sport harbour. Hydraulic Action occurs when waves striking a cliff face compress air in cracks on the cliff face. This exerts pressure on the surrounding rock, and can progressively splinter and remove pieces. Over time, the cracks can grow, sometimes forming a cave. The splinters fall to the sea bed where they are subjected to further wave action. Attrition occurs when waves cause loose pieces of rock debris (scree) to collide with each other, grinding and chipping each other, progressively becoming smaller, smoother and rounder. Scree also collides with the base of the cliff face, chipping small pieces of rock from the cliff or have a corrasion (abrasion) effect, similar to sandpapering. Solution is the process in which acids contained in sea water will dissolve some types of rock such as chalk or limestone. abrasion, also known as Corrasion, occurs when waves break on cliff faces and slowly erode it. As the sea pounds cliff faces it also uses the scree from other wave actions to batter and break off pieces of rock from higher up the cliff face which can be used for this same wave action and attrition. Corrosion or solution/chemical weathering occurs when the sea's pH (anything below pH 7.0) corrodes rocks on a cliff face. Limestone cliff faces, which have a moderately high pH, are particularly affected in this way. Wave action also increases the rate of reaction by removing the reacted material. The ability of waves to cause erosion of the cliff face depends on many factors. The hardness (or inversely, the erodibility) of sea-facing rocks is controlled by the rock strength and the presence of fissures, fractures, and beds of non-cohesive materials such as silt and fine sand. The rate at which cliff fall debris is removed from the foreshore depends on the power of the waves crossing the beach. This energy must reach a critical level to remove material from the debris lobe. Debris lobes can be very persistent and can take many years to completely disappear. Beaches dissipate wave energy on the foreshore and provide a measure of protection to the adjoining land. The stability of the foreshore, or its resistance to lowering. Once stable, the foreshore should widen and become more effective at dissipating the wave energy, so that fewer and less powerful waves reach beyond it. The provision of updrift material coming onto the foreshore beneath the cliff helps to ensure a stable beach. The adjacent bathymetry, or configuration of the seafloor, controls the wave energy arriving at the coast, and can have an important influence on the rate of cliff erosion. Shoals and bars offer protection from wave erosion by causing storm waves to break and dissipate their energy before reaching the shore. Given the dynamic nature of the seafloor, changes in the location of shoals and bars may cause the locus of beach or cliff erosion to change position along the shore. Coastal erosion has been greatly affected by the rising sea levels globally. There has been great measures of increased coastal erosion on the Eastern seaboard of the United States. Locations such as Florida have noticed increased coastal erosion. In reaction to these increases Florida and its individual counties have increased budgets to replenish the eroded sands that attract visitors to Florida and help support its multibillion-dollar tourism industries. Pacifica, California coast after major storms in 1997 (resulting from the strongest El Niño on record) destroyed the houses shown above. Large-scale coastal erosion at Torrey Pines State Reserve, California. Coastal erosion at Torrey Pines State Reserve, California, resulted in the necessary relocation of a scenic overlook. There are three common forms of coastal erosion control methods. These three include: soft-erosion controls, hard-erosion controls, and relocation. 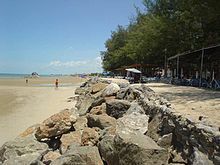 This image represents a typical seawall that is used for preventing and controlling coastal erosion. Hard-erosion control methods provide a more permanent solution than soft-erosion control methods. Seawalls and groynes serve as semi-permanent infrastructure. These structures are not immune from normal wear-and-tear and will have to be refurbished or rebuilt. It is estimated the average life span of a seawall is 50–100 years and the average for a groyne is 30–40 years. Because of their relative permanence, it is assumed that these structures can be a final solution to erosion. Seawalls can also deprive public access to the beach and drastically alter the natural state of the beach. Groynes also drastically alter the natural state of the beach. Some claim that groynes could reduce the interval between beach nourishment projects though they are not seen as a solution to beach nourishment. Other criticisms of seawalls are that they can be expensive, difficult to maintain, and can sometimes cause further damage to the beach if built improperly. Natural forms of hard-erosion control include planting or maintaining native vegetation, such as mangrove forests and coral reefs. Sandbagged beach at the site of Hurricane Sandy. Soft erosion strategies refer to temporary options of slowing the effects of erosion. These options, including Sandbag and beach nourishment, are not intended to be long term solutions or permanent solutions. 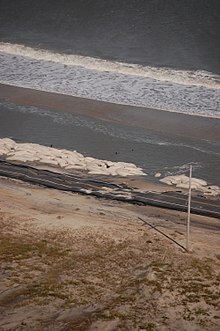 Another method, beach scraping or beach bulldozing allows for the creation of an artificial dune in front of a building or as means of preserving a building foundation. However, there is a U.S. federal moratorium on beach bulldozing during turtle nesting season, 1 May – 15 November. One of the most common methods of soft erosion control is beach nourishment projects. These projects involve dredging sand and moving it to the beaches as a means of reestablishing the sand lost due to erosion. In some situations, beach nourishment is not a suitable measure to take for erosion control, such as in areas with sand sinks or frequent and large storms. Storms can cause erosion hundreds of times faster than normal weather. Before-and-after comparisons can be made using data gathered by manual surveying, laser altimeter, or a GPS unit mounted on an ATV. Remote sensing data such as Landsat scenes can be used for large scale and multi year assessments of coastal erosion. ^ Ueberman, A.S. and O'Neill Jr, C.R., 1988. Vegetation use in coastal ecosystems. Cornell Cooperative Extension Information Bulletin 198, Cornell University, Ithica, New York. 32 pp. ^ New York Coastal Erosion Hazard Areas Act of 1981. ^ Gibb, J. G., 1978. Rates of coastal erosion and accretion in New Zealand. New Zealand Journal of Marine and Freshwater Research, 12(4): 429–456. ^ Valvo, Lisa M.; Murray, A. Brad; Ashton, Andrew (1 June 2006). "How does underlying geology affect coastline change? An initial modeling investigation". Journal of Geophysical Research: Earth Surface. 111 (F2): F02025. doi:10.1029/2005JF000340. ^ "The Impact of Coastal Erosion in Australia". Archived from the original on 15 March 2016. Retrieved 15 March 2016. ^ Xia, Rosanna (13 March 2019). "Destruction from sea level rise in California could exceed worst wildfires and earthquakes, new research shows". Los Angeles Times. Retrieved 15 March 2019. ^ Cambers, Gary; Sibley, Steve (10 September 2015). Cambridge IGCSE® Geography Coursebook with CD-ROM. Cambridge University Press. ISBN 9781107458949. ^ Oldale, Robert N. "Coastal Erosion on Cape Cod: Some Questions and Answers". U.S. Geological Survey. Archived from the original on 6 May 2009. Retrieved 11 September 2009. ^ a b c Dean, J. "Oceanfront Sandbag Use in North Carolina: Management Review and Suggestions for Improvement" (PDF). Nicholas School of the Environment of Duke University. Archived (PDF) from the original on 4 March 2016. Retrieved 11 October 2013. ^ Knapp, Whitney. "Impacts of Terminal Groins on North Carolina's Coast" (PDF). Nicholas School of the Environment of Duke University. Archived (PDF) from the original on 12 March 2014. Retrieved 15 October 2013. ^ a b c Managing Coastal Erosion. National Academies Press. 1989. ISBN 9780309041430. ^ McPherson, M. "Adaptation to Sea-Level Rise in North Carolina" (PDF). Nicholas School of the Environment of Duke University. Archived (PDF) from the original on 4 March 2016. Retrieved 25 October 2013. ^ "Tracking Coastal Erosion From Storms". npr.org. Archived from the original on 4 March 2016. Retrieved 3 May 2018. Wikimedia Commons has media related to Coastal erosion.